I would like to start off by apologizing for the poor photo quality in this post! I was literally having to hold my two munchkins back from the table while I tried to snap this photo! They LOVE this dinner and I haven’t made it for a while so they were a little excited to dig in! 🙂 Every Mom knows that dinnertime can be a challenge and trying to incorporate healthy eating can seem impossible with picky little eaters! I love this recipe because it is not only delicious it is also fun! Any type of “make your own” meal is a hit with our kids! 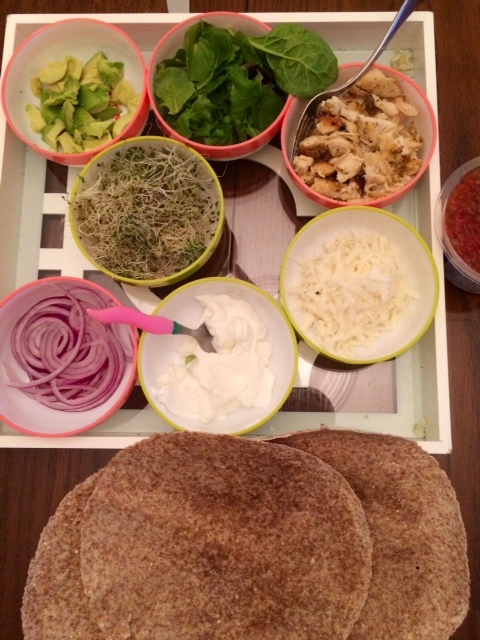 My kids love choosing their own ingredients and building their very own wrap! In this recipe I listed the ingredients I used, but you can really use whatever you have on hand! Isn’t eating clean so fun?! 🙂 I hope you enjoy this! It’s Not The Colour That Counts!